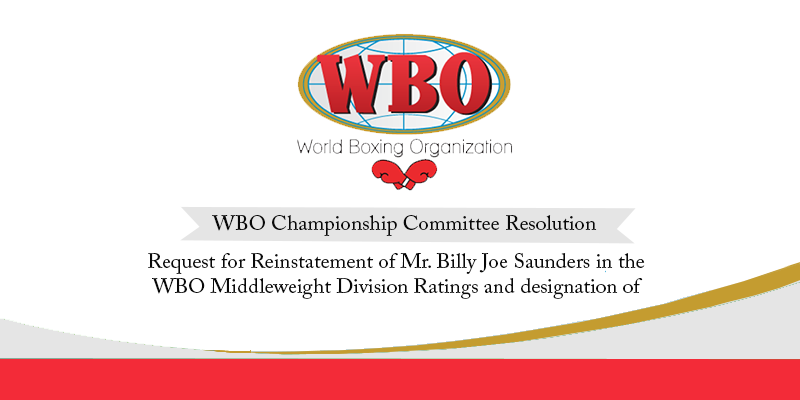 Request for Reinstatement of Mr. Billy Joe Saunders in the WBO Middleweight Division Ratings and designation of Mandatory Challenger. The present ruling arises from a petition filed on January 15th 2019, on behalf of Mr. Saunders’ legal representative Mr. David House, whereby the World Boxing Organization (WBO) was informed of Mr. Saunders’ current status with regard to his duties and obligations pursuant to the conditions of his suspension set forth by this Committee on October 11th 2018. Further, enclosed with the aforementioned petition, the WBO received and acknowledge evidence ratifying Mr. Saunders’ full and successful compliance with all requirements per this Committee’s ruling. Conversely, the petition seeks reinstatement of Mr. Saunders at the number one (1) position in the WBO World Middleweight Division Ratings, and official designation as Mandatory Challenger within the referenced division.